Iron is an essential functional component of hemoglobin, the molecule that transports oxygen throughout the body. 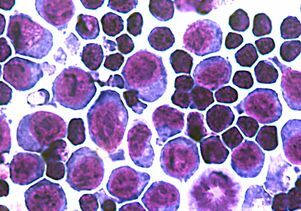 Using a mouse model, researchers found that erythroferrone is made by red blood-cell progenitors in the bone marrow in order to match iron supply with the demands of red blood-cell production. Erythroferrone is greatly increased when red blood-cell production is stimulated, such as after bleeding or in response to anemia. The erythroferrone hormone acts by regulating the main iron hormone, hepcidin, which controls the absorption of iron from food and the distribution of iron in the body. Increased erythroferrone suppresses hepcidin and allows more iron to be made available for red blood-cell production. "If there is too little iron, it causes anemia. If there is too much iron, the iron overload accumulates in the liver and organs, where it is toxic and causes damage," said senior author Dr. Tomas Ganz, a professor of medicine and pathology at the David Geffen School of Medicine at UCLA. "Modulating the activity of erythroferrone could be a viable strategy for the treatment of iron disorders of both overabundance and scarcity." The early findings were reported online June 1 in the journal Nature Genetics. "Our previous work anticipated that a regulator of hepcidin could be secreted by the bone marrow," said the study’s first author, Leon Kautz, a postdoctoral fellow at UCLA. "In this research, we searched for new substances that were made in bone marrow that could fill that role." Researchers first focused on what happens in the bone marrow after hemorrhage. From there, they focused on a specific protein that was secreted into the blood. This protein attracted their attention because it belonged to a family of proteins involved in cell-to-cell communication. Using recombinant DNA technology, they showed that the hormone suppressed the production of hepcidin and demonstrated the effect it had on iron metabolism. The team foresees that the discovery could help people with a common congenital blood disorder called Cooley’s anemia, also known as thalassemia, which causes excessive destruction of red blood cells and of their progenitors in the bone marrow. Many of these patients require regular blood transfusions throughout their lives. Most iron overload is attributed to the iron content of transfused blood. However, even patients who are rarely, or never, transfused can also develop iron overload. "Overproduction of erythroferrone may be a major cause of iron overload in untransfused patients and may contribute to iron overload in transfused patients," said study author Elizabeta Nemeth, a professor of medicine at the David Geffen School of Medicine at UCLA and co-director of the UCLA Center for Iron Disorders. "The identification of erythroferrone can potentially allow researchers and drug developers to target the hormone for specific treatment to prevent iron overload in Cooley’s anemia." The discovery could also lead to treatments for other common anemia-related conditions associated with chronic kidney disease, rheumatologic disorders and other inflammatory diseases. In these conditions, iron is "locked up" by the effect of the hormone hepcidin, whose levels are increased by inflammation. Erythroferrone, or drugs acting like it, could suppress hepcidin and make more iron available for red blood-cell production. The next stage of research is to understand the role of the new hormone in various blood diseases and study the molecular mechanisms through which erythroferrone regulates hepcidin. Additional study authors included Grace Jung and Erika Valore of UCLA and Stefano Rivella of Weill Cornell Medical College in New York. The study was supported by a grant from the National Institute of Diabetes and Digestive and Kidney Diseases and the National Heart, Lung and Blood Institute. The Board of Regents of the University of California is the owner of patent applications and uses directed at erythroferrone, which are managed by UCLA’s Office of Intellectual Property and Industry Sponsored Research. This intellectual property is the subject of license negotiations with a company for which authors Ganz and Nemeth are scientific advisors and equity holders. Other disclosures are available in the manuscript.